Baluster: Vertical member in a guard placed between the handrail and the tread in the open portion of a stairway, landing or balcony (Fig. 96D). Effective Depth: The portion remaining after the stringer has been cut out or ploughed to fit the treads and risers (Fig. 97). Guard: Protective barrier, with or without openings, placed alongside the open portion of a stairway, landing or balcony. Handrail: A rail running parallel to and on at least one side of the stairs, to be grasped when ascending or descending. Landing: A flat platform incorporated in a stairway, at least as wide and as long as the width of the stairs. Normally used to change direction of the stairs at right angles and to avoid the use of winders. Newel: The main post for the handrail at the start and finish of the stairs, and the stiffening post at changes of direction and landings. Nosing: The projection of the tread beyond the face of the riser (Fig. 97). Rise: The vertical height of a step (Fig. 97). Riser: Closed Riser: The vertical board under a tread. Open Riser: The vertical board under the tread is omitted and the tread is supported on the stringers only. 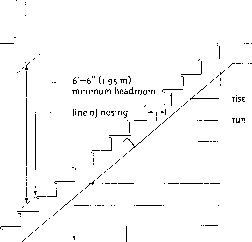 Run: The net depth of the tread measured from riser to riser (Fig. 97). Stringer: The member supporting the treads and risers. Cut-out (Open): A stringer cut out to fit the treads and risers (Figs. 98B and C). 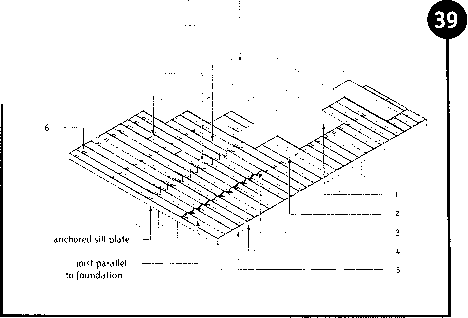 Ploughed (housed): A stringer grooved to receive the exact profile of the treads and risers (Fig. 96C). Total Rise: The distance measured vertically from finish floor to finish floor. Total Run: The distance measured horizontally from finish floor on one level to finish floor on another. Tread: The horizontal plane of a step. Winder: A radiating or wedge-shaped tread converging on a centre point at an angle of 30°. 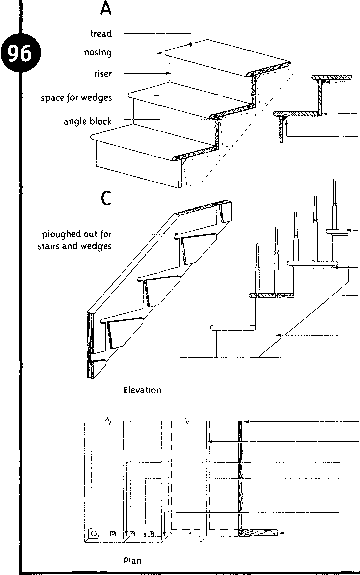 Parts of stairs: (A) risers and treads tongued and grooved together; (B) risers and treads connected with angle blocks; (C) housed stringers; (D) cut-out stringer (open) showing balusters and mitre-nosing return. What are stringers in a house?